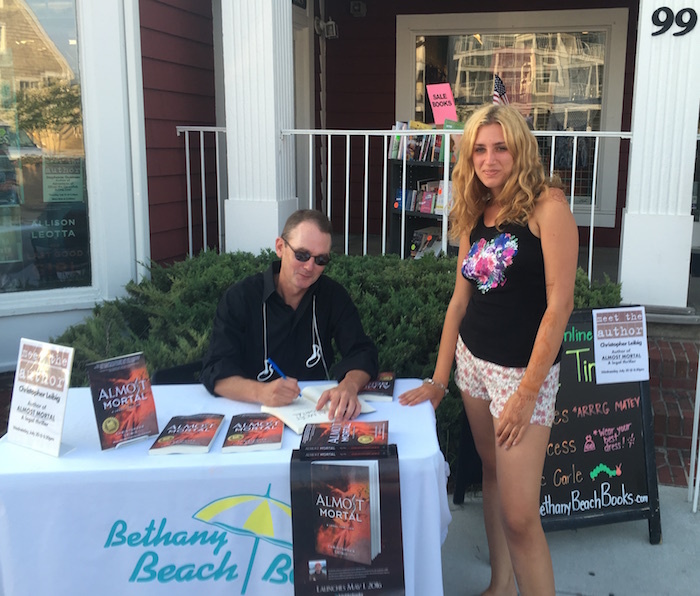 Next Up: Appearing October 1 at Browse About Books – Come Join Us! Emerging criminal defense attorney Sam Young has always known he had a gift. Or a curse. Minor psychic abilities, he sometimes thinks. Sam is hired by an attractive young nun, Camille Paradisi, to help discover the identity of a serial killer before her Pastor is exposed for not having turned in the man after a confession – thereby allowing another murder to occur. While Sam’s psychic abilities seemingly enhance as he investigates the case, he quickly learns that the enigmatic Camille is not telling him everything. 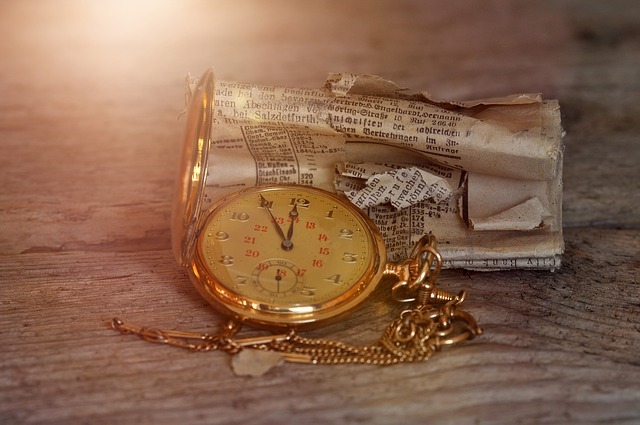 Camille asks Sam to read sections of an old journal anonymously mailed to the Church which she tells him she believes may have been authored by the killer/confessor. The journal purports to tell the life story of a man with mind control and other special powers who claims to be a descendant of the fallen angels cast of out heaven by God. Sam ponders its relation to the case while using his legal and investigative skills to establish the identity of the killer. As he learns more about the murders, the mystery author, and Camille, Sam begins to realize the so called “Rosslyn Ripper” case may have implications beyond his imagination – including about his own past. 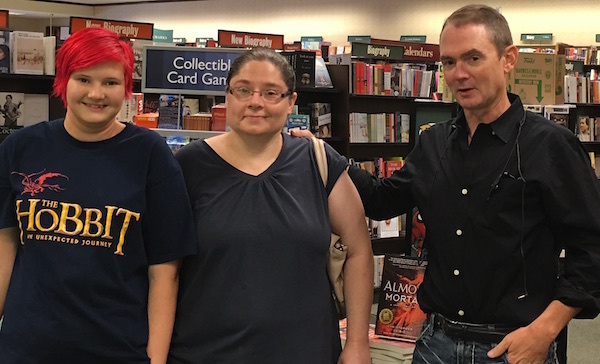 Here are a few scenes from the Charlottesville Barnes & Noble book signing on September 17th. Next up Rehobeth Beach on October 1! 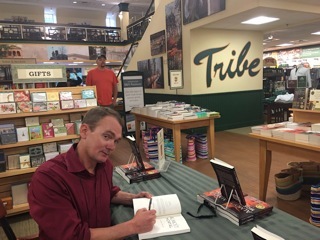 Cool to see one’s name and book cover when you walk into Barnes & Noble – Thank you, Charlottesville! 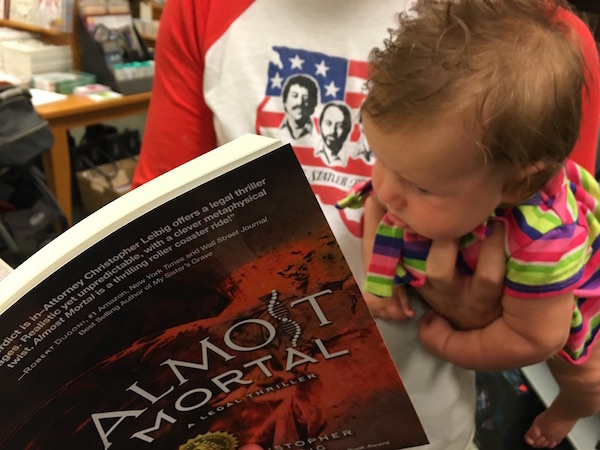 Meet Almost Mortal’s official youngest fan! 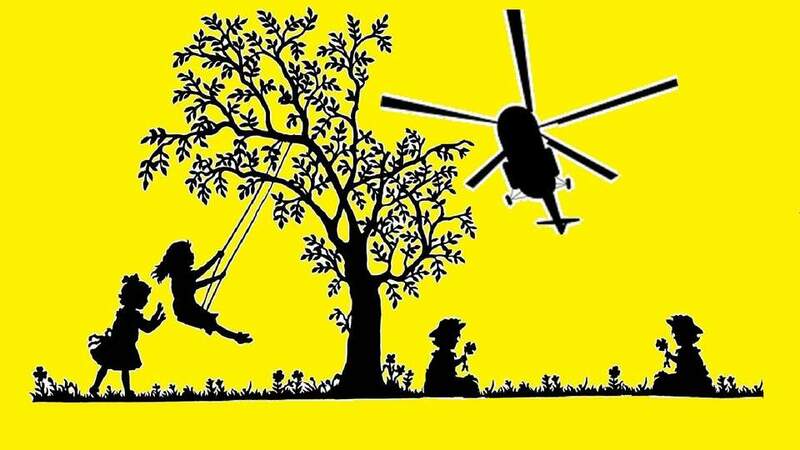 Book fans are the BEST fans… Ask any reader! 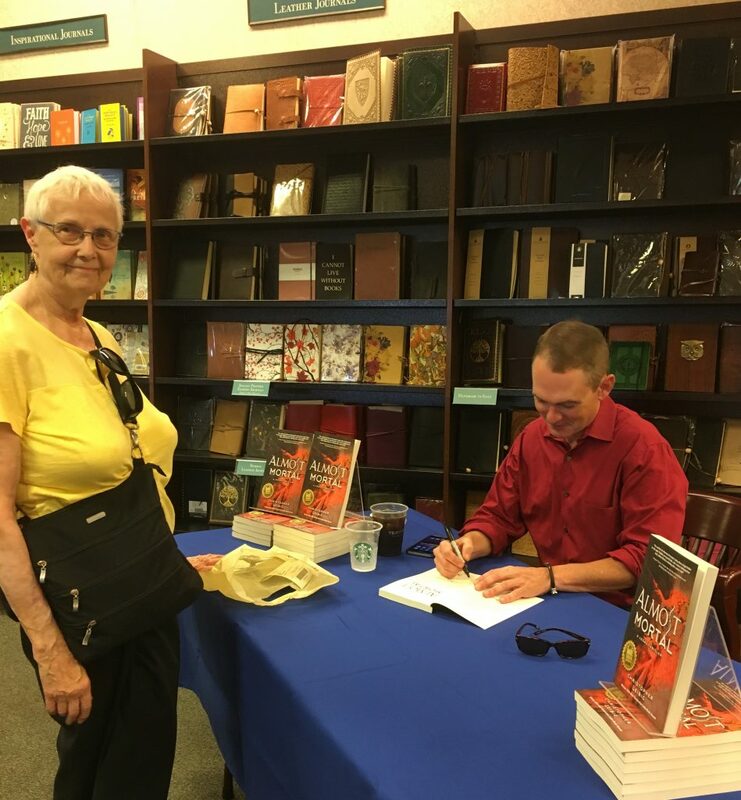 Also, enjoy this article recently posted… And I look forward to seeing you at my next stop! 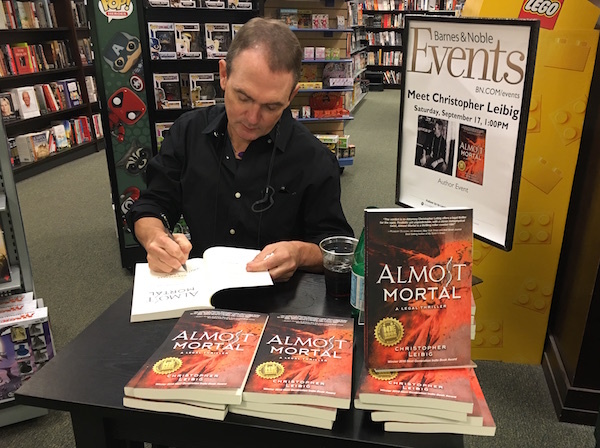 It’s been an exciting few months and still on the road signing Almost Mortal! 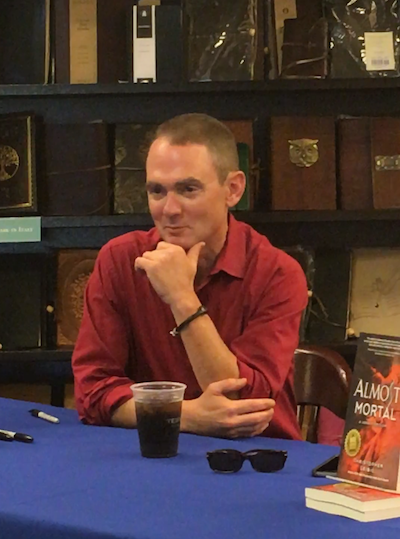 This photo is from the signing on August 13 at the beautiful Barnes & Noble in Fairfax, VA.
Next up, come on out and say hi at the Barnes & Noble in Manassas, VA. It’s on Surrey Road at Westgate Plaza. The signing takes place Saturday August 27, 2016 1:00 PM. 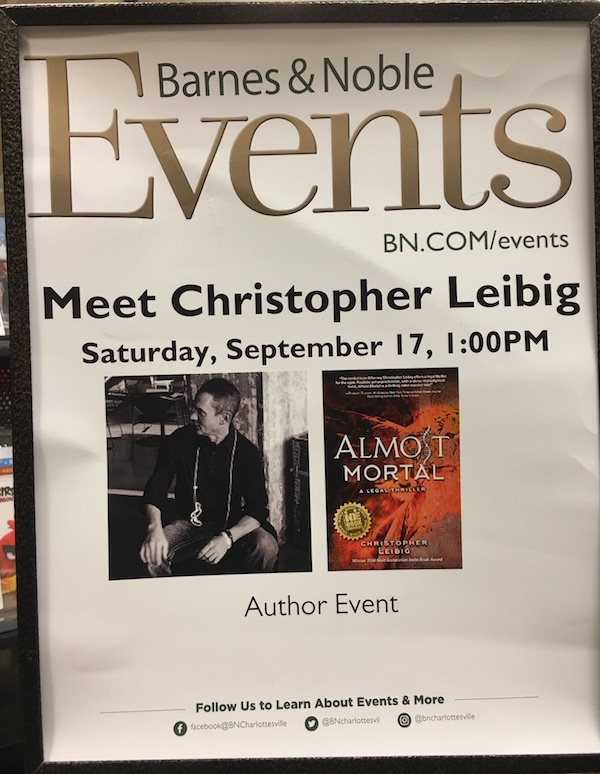 On the Road with Chris Leibig and Almost Mortal! 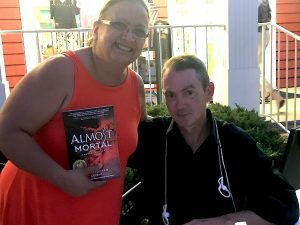 Almost Mortal enjoyed two more successful signings in past couple weeks. The first took place at the Potomac Yards Barnes & Noble (see the full album of images HERE). Then, on Independence Day weekend it was onto the College of William and Mary on July 3 in Williamsburg, VA (see full album of images HERE). 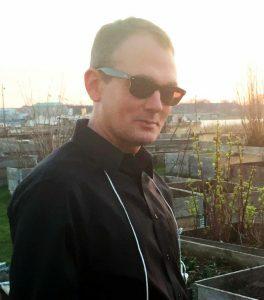 You can visit the link at http://bit.ly/FreeRng for prices and showtimes at the Logan Fringe Arts Space, running five performances 7/8 through 7/23. 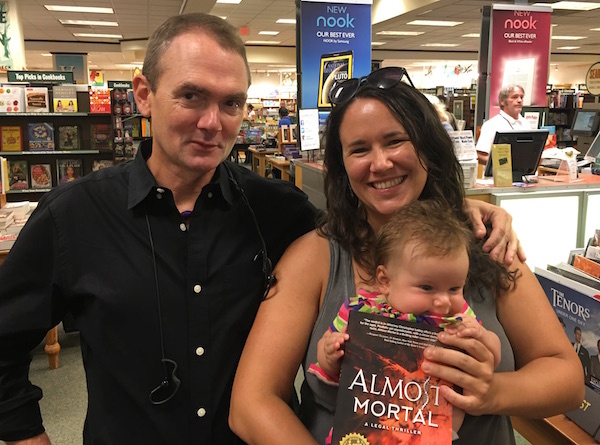 The Verdict is In: Early Success for Almost Mortal! 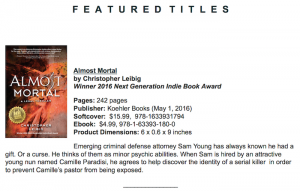 Almost Mortal in Amazon’s Top 100 Legal Thrillers! 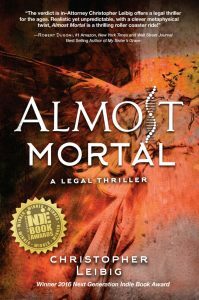 In less than three weeks on the street, I’m humbled and pleased to announce that Almost Mortal is already making tracks; today I broke into the coveted Amazon Top 100 for legal thrillers. Thanks for your support and with your ongoing kind reviews maybe next I’ll be announcing the top 10! 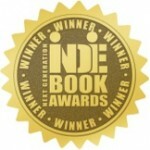 At the recent Book Expo America, the book was awarded the Indie Next Gen award. 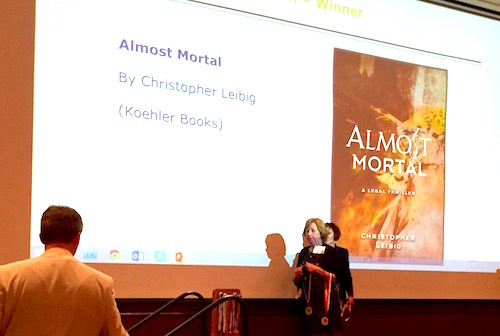 Sadly, I wasn’t there to receive it, but instead sent my publisher, John Koehler of Koehler Books (read his cool coverage article here) and my publicist, Shari Stauch of Where Writers Win (read their cool coverage here!). 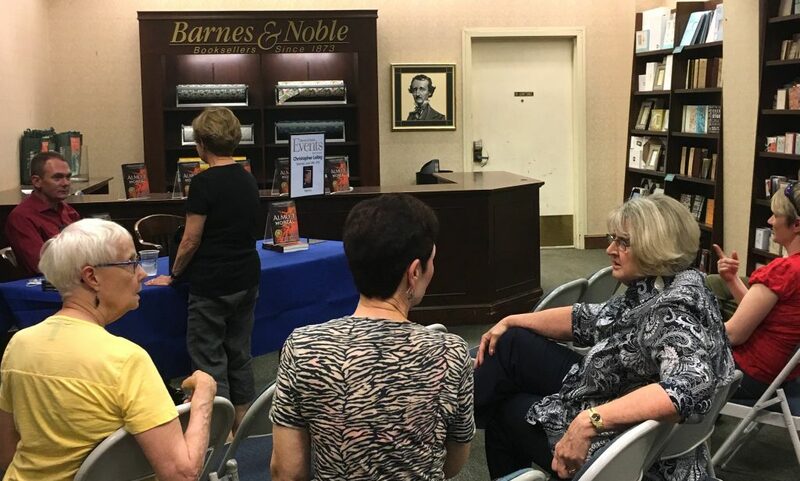 Also excited to share that I’ll be doing several book events in June and July, beginning with a signing at the Seven Corners Barnes & Noble in Falls Church, VA on June 18 from 2-4 p.m. Then it’s on to William & Mary Bookstore at William & Mary College in Williamsburg on July 3 (12-3 p.m.); Chesterfield Barnes & Noble July 9 (2-4 p.m.) and Bethany Beach Books on July 20 in Delaware (6:30 – 8:30 p.m.). Stay tuned for more news on these and other signings both here on the website and at my Facebook page. 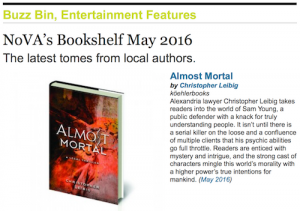 Meanwhile, thanks to Northern Virginia magazine for their kind posting about Almost Mortal. You can read that HERE. 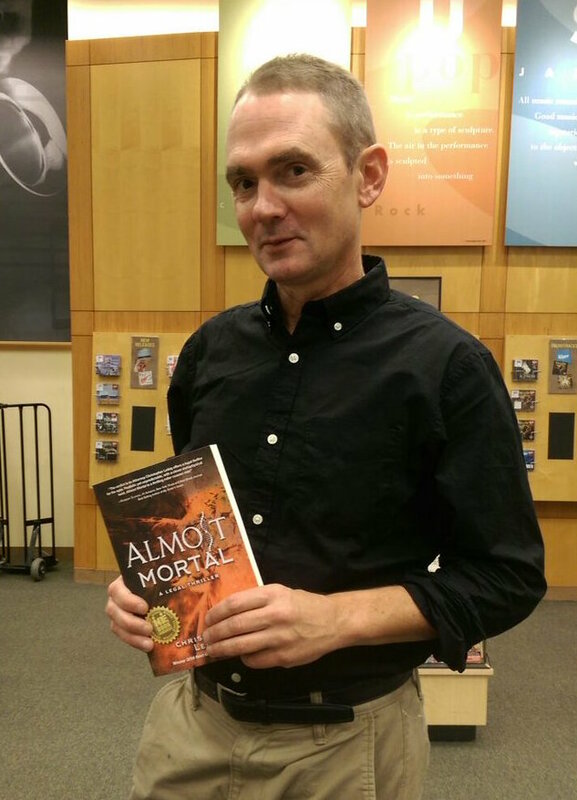 Also exciting (well for me it is), Almost Mortal is now listed as a featured title on the Koehler Books website. Again, my sincerest thanks to all you readers and fans – Keep in touch and appreciate you sharing this with your reading friends, too! 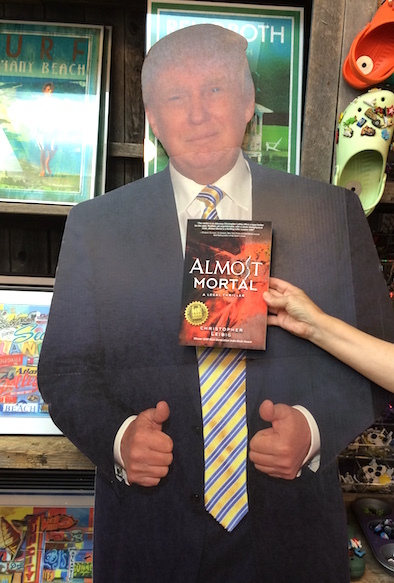 Haven’t read Almost Mortal yet? Please order it HERE!